Nick Douch, from the Dorset Funeral Plan, which sponsors Saturday league cricket in Dorset, presents the June 2016 ‘team of the month award’ to James Miller from Wimborne first XI. 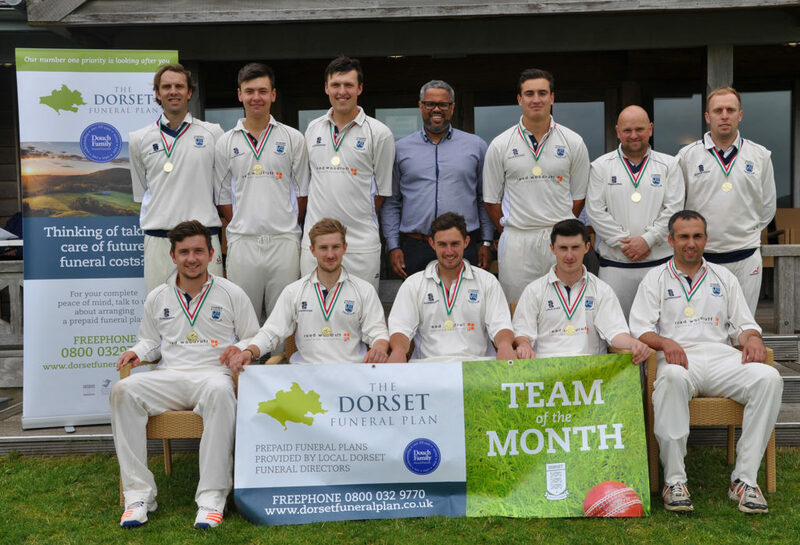 Wimborne CC first XI picked up the Dorset Funeral Plan team of the month award for June – after four wins and picking up maximum points in all of them. Skipper and wicket-keeper James Miller put the success down to the powerful top four batsmen and up to five spinners in the side. The run took them to the top of the table in the Dorset Premier League and Nick Douch from the sponsors – the Dorset Funeral Plan – presented them with a trophy, individual medals and a bottle of bubbly. Wimborne CC, whose first and second elevens play at The Leaze, are hoping to maintain their position and take the title. Skipper Miller said: “Basically we score heavily and then rely on the spinners to squeeze out the opposition. “Our top four of Simon Woodruff, Colin Randall, Mark House and Tom Caines have all scored heavily. “Our spinners, including Tom Caines, Harry Beardsley, George Bartlett and Jo Weld have been excellent. “Our pitch isn’t particularly spin-friendly, but they use guile and variations in pace to take wickets.